People who are desperately looking for a job and ways to earn money fast may fall prey to job scams that have increased in this tough economic situation. Do not get swayed by get-rich-quick schemes, as most of these are designed to make you a victim of a job scam. Jobseekers need to be very careful while looking for a job. If you really want to avoid these scams, you need to separate job searching from earning money quickly. It is mostly females between the age of 18-49 that fall prey to these job scams. Even smart people get victimized in these scams. Given below are some important tips that can help you to spot job scams and avoid them. That means: hold tight to your cash. When an employer asks you to pay a fee upfront, this simply signals that something is not right. You will come across various offers where depositing a fee will promise to make you wealthy or provide you a list of best paying home jobs. Don’t fall for such offers. If it is a legitimate employer, they will never ask to pay money in advance. Another important tip to avoid job scams is to avoid paying heed to ads that make outrageous claims like ‘Make money while you sleep!’ and other similar job advertisements. These ads are specially designed to target desperate jobseekers. If you are not careful enough, you may fall prey to such scams. Remember that legitimate employers will want candidates who carry some specific job skills rather than inviting just anyone and offering them lots of money. According to consumer protection experts, ‘work from home’ or ‘work at home’ are not job titles and jobseekers should be warned. If you come across job titles like these in ads, there is a good chance that it will lead you to a job scam. Job titles like these are used a bait to reel in desperate people looking for ways to earn money quickly. Many times, you will receive emails in your inbox promising you a lot of wealth. Why would someone else be interested in making a wealthier? Moreover, a man whom you have never known? Don’t see these emails as miracles. They are nothing but ‘SPAM’. Simple move these emails to your trash box. Don’t even click links like ‘Remove me from this list’, at the bottom of the email. This is just a tool to find out whether an email is active. 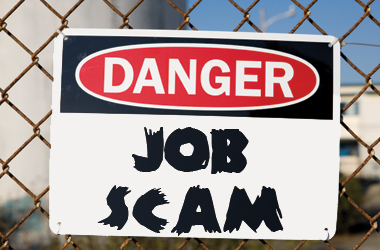 There are many jobseekers that fall prey to job scams. And this is really very unfortunate. Please keep all the above mentioned tips in mind and do not act in desperation. More importantly, don’t look for short-cuts or get-rich-quick schemes, as this will only lead you to job scams. And consequences may include identity theft, unauthorized credit card changes or loss of savings!